The Fine Gael MEP and former presidential candidate was the only Irish MEP not to vote in favour of the final resolution but insisted he supports the resolution. FINE GAEL MEP Gay Mitchell abstained from voting on a European Parliament resolution passed on Tuesday that called for the protection of EU citizens from homophobia. Amendment 2 to the resolution was passed by 394 votes to 176, with 72 abstentions. All 11 other Irish MEP’s voted in favour of the amendment, but Mitchell abstained according to the VoteWatch Europe website. The Dublin MEP and former presidential candidate voted in favour of the first draft of the resolution but that draft was rejected. A spokesperson for Mitchell told TheJournal.ie that he was in favour of the resolution but felt that the amendment that was passed encouraged the EU Commission involve itself in the laws of EU member states, something not allowed under the principle of subsidiarity. Subsidiarity ensures that decisions are taken as closely to citizens and nation states as possible. “Mr Mitchell clearly voted in favour of the resolution by voting in favour of Amendment 1 but he abstained on Amendment 2 because it proposed that the commission should involve itself in matters of subsidiarity,” according to the spokesperson. “He did not vote against the second amendment because he wished to indicate his broad support against homophobia and discrimination on grounds of sexual orientation and gender identity, as he made clear in an explanation of vote on the record,” the spokesperson added. The European grouping to which Fine Gael belongs, the European People’s Party (EPP), were against the final successful Amendment 2 but Mitchell’s Fine Gael colleagues Jim Higgins, Mairead McGuinness and Seán Kelly voted in favour of it. Mitchell, who is joint coordinator for the EPP grouping, has previously announced that he will not be seeking re-election to the European Parliament in this year’s election. The text to which Mitchell seems to have objected in the second amendment is where it calls on the the commission to “use its competences to the fullest extent”. 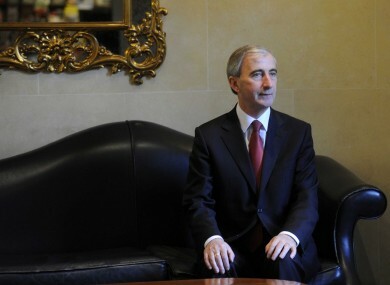 Mitchell’s colleague Seán Kelly told TheJournal.ie that he has not spoken to Mitchell about his position following the vote and said that the Fine Gael members had not held a formal discussion before the vote. Kelly said that he personally decided to vote against the recommendation of his grouping and that this freedom is a regular occurrence. Mitchell, he argued, has consistently been an advocate for equality for LGBT people. Efforts made to speak directly with Mitchell about his abstention were unsuccessful. Email “Mitchell cites technicality as he is only Irish MEP to abstain from EU anti-homophobia vote”. Feedback on “Mitchell cites technicality as he is only Irish MEP to abstain from EU anti-homophobia vote”.